Long Battery Life : Up to 200% extend your iphone XS / X battery life and the battery case can effectively provide extra battery use time to your Phone which is equivalent to add 24 hours talking time, 6 hours 3D gaming or 20 hours web browsing time,18 hours video. Charging and Protecting 2in1: High quality battery case 6500mAh iphone XS / X battery cases with 360scratch-guard, dual layer protection to protect your iPhone X from scratches and other daily wear and tear. Internal safe chips prevents the power case short-circuiting, overheating and over-charging. Perfect charging your iPhone XS /X battery power, 4 LED indicator will show how much juice is left. Ultra thin & Easy Installation : Without doubling its size, adding only 0.19 inch and 3.5 oz to your iPhone X / XS battery case insert your iPhone X/XS into the lightning output port. The iphone X/XS extended battery cover uses a lightning input port to enable recharging and data transfer. Advanced Sync-through Technology: Amazing sync-through technology that you can simultaneously charge your Phone and iphone XS/X battery case charger together ,conveniently sync your iPhone to your Macbook, PC or laptop without having to take the battery case off. 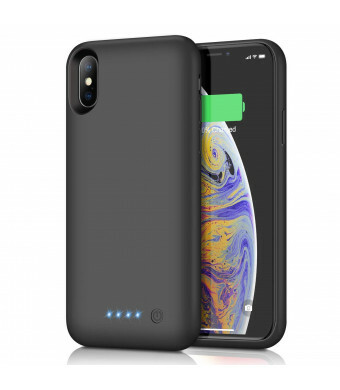 What You Get: 1x iPhone XS/ X 6500mAh Black Battery Case, 1xUser Manual. Also you can receive 18 months quality warranty. Any question, Feel free contact us. we will response you asap (within 24 hours). 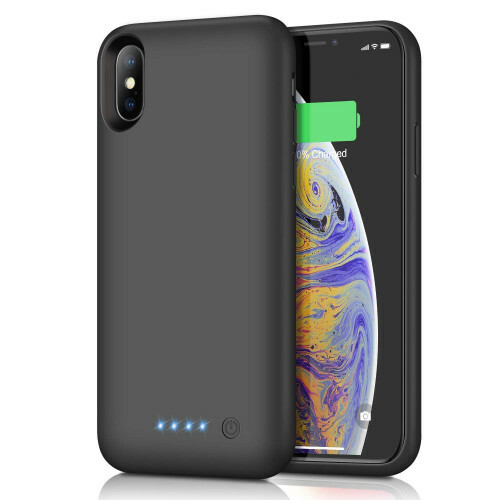 iPhone XS / X /10 Battery Case - External Battery Backup Protective Charger Case for iPhone XS; iPhone X; iPhone 10 - 4 LED Indicator Light. 1.The Battery Case only suit for iPhone XS / iPhone X / 10. Not fit for iPhone XS Max. 2. Compatible with Wireless / Bluetooth headphone.